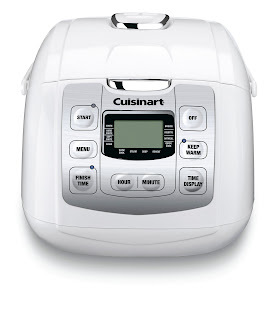 In keeping with one of my New Year’s resolutions–keep it simple–I happily opened my new Cuisinart Rice Plus Multi-Cooker, excited at the prospect of what awesome culinary wonders it could produce. After several days of frigid temps here in the northeast, some comfort food was in order and with Sunday dinner looming in the not-so-distant future, I thought why not give it a whirl? I first looked about this new product at a mommy bloggers brunch I recently attended, and couldn’t help but notice how many moms were poring over the Cuisinart table with more enthusiasm than a sale at Bloomingdale’s. Naturally, I was curious, too. While I consider myself a relatively able cook, my dishes are hardly works of art, often sticking to a basic repertoire of meatloaf, roast chicken and spaghetti and meatballs. How nice it might be to give a new recipe a try in a sleek gadget designed for one-pot family meals? Well, the Cuisinart Multi-Cooker did not disappoint. Simply add your ingredients, set a desired time and you’re good to go. What’s really cool is the Fuzzy Logic technology–no, I’m not talking about how to reason with your kids when you’re sleep-deprived. It’s a special technology that detects fluctuations in cooking and automatically adjusts your settings, so dinner doesn’t go up in smoke and tastes great. If you’re a working mom, you’re sure to love the Keep Warm feature that lets your food stay just hot enough for you to walk in the door and get the table set. As for my family, our dinner of chicken cacciatore was a hit; the chicken was tender and the veggies, robust. And hey, if the kids eat it, isn’t that the best measure of success? In a Nutshell: Set it and forget it? The Multi-Cooker is sure to dish up some crowd pleasing meals, all the while keeping meal prep simple. Clean-up is a snap, too.